“He that dwells in the secret place of the most High shall abide under the shadow of the Almighty” (KJV). My father grew up a faithful Episcopalian saying his prayers on his knees every night even as a grown man. His mother took credit for instilling such faith in her youngest son. He passed that faith on to me. It began when he invited me as a young girl to join him at the early church service at our home church, Trinity Episcopal in Baton Rouge. It began at 7:30 a.m. and was over in 30 or 40 minutes. We entered in silence, me wearing my lace head cover and he a coat and tie. He always held the doors for me and walked down the aisle with me. He bowed his head and I curtsied toward the brass cross sitting on the alter in the chancel. He entered the pew pulling down the kneeler, the wooden padded bench for our knees to rest on in prayer. We silently prayed and sat down on the pew. There was no music, no singing, and no sermon. But there was a beautiful magical service of hearing God’s Word from both the Old Testament and then from the Gospels of the New Testament. The best part of the service was celebrating the Lord’s Supper. I never left one of those Sunday morning worship services without feeling closer to God than I was the day before. Sometime during that time of my life, I forgot to look for God and began to realized God was already with me inside my heart. I would seek out quiet places to talk to God such as a fig tree in a garden on my way home from school, or swinging on the front porch of my house, standing by my open bedroom window listening to the rain fall between the branches of the cedar tree just outside. As I grew older, I took my relationship with God another step by asking advice when I needed help. That may sound childish or silly, but it always worked. At first appearance one might say I had a lot of coincidences in my life, but were they? The word coincidence is related mathematically to the idea of angles that coincide. When two angles meet this way, they do so perfectly. When I got my answers was it a coincidence or God working through me perfectly? For example, I might have a problem with a simple decision to go out with boy or not (when and if he asked). Turning it over to God did two things. First it freed me up from stressing over whether to say yes or no and second when I woke up the next day and had my answer, I was thrilled. Today, they call this letting go and letting God. The secret place of the most high is not a place but a state of mind. For we can talk to God anywhere whether it’s in church, on the side of the road, on a noisy playground at school, or closed off in your room listening to the rain filled with the sweet scent of cedar. As an adult this line in Psalm 91 came to mean something else to me. My future husband was being shipped off to who knew where during the Viet Nam era and I was beside myself with concern for his safety. Then one day, his dear sweet grandmother, we called MyMy, Rachel Richardson Metcalf, wrote me a beautiful letter. She told me that I was not alone in my love for her grandson that I should read Psalm 91 every night before going to bed and my fears would be eased. It did not take me long to memorize the sixteen verses. To live eternally in the household of God, I am living out my calling to be like God – with power, wisdom, love, and intelligence. I give thanks to my Father for giving me the opportunity to dwell in the household of the God with him, to respect me enough teach me early on that God and I are one. And to this day, I live in faith that I, “Abide under the shadow of the Almighty” who also lives in me, as me, for all eternity. Recently my husband and I volunteered at the Second Annual Adult Autism Symposium in Chattanooga. This is the only such gathering east of the Mississippi River and so many of the attendees came from out of state. The creator of this event is Scott Kramer, program director and founder of the Centre for Adult Autism, Southeast USA (GCA.) The purpose of this organization is, “Empowering autistic adults and young adults and their parents/caregivers by serving as a resource center to provide mutual support, information & activities.” The GCA is a program of the Chattanooga Autism Center (CAC) which my husband, Mark and I volunteer regularly for as well as help to raise money by sponsoring Team Lexi at the CAC Walk every year. At the symposium I met adults with Autism, parents of adults with Autism, speakers with knowledge to share, and vendors with goods to sell for anyone under the spectrum and vendors with Autism selling their art, inventions, and ideas. For example I met at young man and his mother who started an alternative baseball league for teens, age 15 and up and adults with Autism. He lives in the Atlanta area and now has leagues in seven states and was looking to start a league in the Chattanooga area. His name is Taylor Duncan. I took a few minutes of my time to hear his message and left with a heart filled with joy. What an inspiration Taylor is along with his mother who sat proudly supporting her son with his effort telling me that for the first three years there was only one team but members of a minor league volunteered to give the new alternative team tips and so each time they met they played scrimmage games. In 2018, Taylor Duncan was awarded House Resolution 1420 by the Georgia House of Representatives for his work in Alternative Baseball. “…as he thinketh in his heart, so is he,” (Proverbs 23.7) What we think and say determines our life experiences. Yes, the first time I met an adult or child with Autism that did not make eye contact when talking to me, it was a new experience. But I realized early on that they still see me and I see them and if I listen to them instead of watch them talking, I really hear what they are saying. I then can think in my heart instead of my head and be the person I’m called to be. It is that time of year that students, parents, teachers and faculty begin the new year at their respective schools. I am very grateful that my grandchildren live and go to schools where they are treated with love, respect, kindness and understanding. And that are receiving a superb education. My one request would be that no one go back to anything! By this I mean to resolve to let go of a backward-looking consciousness. That is, don’t say such things as, “go back to work” or “go back to school.” These words imply monotony and unhappiness. Let the new year be a time of reaching forward with eagerness and anticipation. In the days and months ahead live each day as if were the only day of eternity. For it is true that the most important day is the present day. There is no point in looking back or wasting time trying to look ahead. Instead of keeping a calendar counting down the days to the first school break, countdown to upcoming events, celebrations, parties, and fun activities. Post successes and achievements. Be proud that school is alive and well. Success is based on the fact the we all have something in common. We all love our children and grandchildren and we all only want what is best for them. Knowing that we are one in this effort makes us strong and powerful and lifts us up which makes our schools wonderful. And so I wish for you a great new year and an adventure for all concerned. I plan to stay involved in all my grandchildren’s schools and be there for others who would also do so if they could. For today is the most important year of my life and yours, the midpoint between all that we have been and all that we can and will become. This year, 2018 has, for me, several serendipitous qualities. For one, I graduated from high school in 1968 at the age of 18. I, like the majority of my classmates was 68 years old at the reunion. But I have to admit, turning 68 years old has changed me more than any other birthday. And for the good, I believe. Philosopher and author, Wayne Dyer published a book not long before he passed away entitled, “ I Can See Clearly Now.” It is a book about his life and how when looking back on those times, he was able to see more clearly what really was going on or in some cases why it happened. It got me to thinking about my own life and how I got to be where I am today, a sixty-eight year old woman. My earliest memory was one when I was age three or four. My brother and I are Irish Twins, born in the same calendar year, me in January and he Christmas day in December. It was Easter and my mother had made matching outfits for the two of us. My sister was not yet born or was a baby. Our mother was an excellent seamstress making her clothes as well our clothes. What I remember most was not that my little brother and I were dressed so beautifully but that my mother was not happy that Sunday morning. I remember clearly sitting in the big arm chair in our little living room of our home. My brother and I sat together, side-by-side, our legs too short to reach the foot stool at our feet. He was crying silent tears. I don’t remember why, just that he would not stop crying and the more he cried the more upset my mother got. After we got home, my mother started to get us out of our new clothes. By now my brother is exhausted from not trying to cry and we both show as much patience as two small children can to keep from upsetting our mother more than she was already upset. My new Mary Jane patent leather shoes would be tucked away until the next time we went to church and my brother’s new saddle oxford shoes were removed. Doing so, my mother discovered a wad of tissue paper jammed into the foot of each of my brother’s shoes. In that split second my mother realized that in taking the new shoes out of the box she had neglected to pull out the tissue and thus my brother was forced to wear his new shoes with the tissue cramping his little feet. This is why he had been crying and yet was unable to tell our mother what was wrong. Later when she told this story to us, what I remembered remained the same but what I forgot was her over-whelming sense of regret and shame she felt for letting this happen to one of her children. It was not a terrible thing, but one that could have been avoided had she stopped being upset with my brother and taken the time to figure out why he was crying. I can see clearly now, at age 68, while sitting in that chair, holding my little brother’s hand that I was able to see things from a new perspective. I watched my mother who sat on the step stool discover that tissue paper, and it was the first time in my life that it occurred to me that things just might not be what they seem. It also marks the first time I began to wonder why my mother was always so unhappy. I inherited that same stool and today when I prop my feet upon it, I am mindful of the lessons I learned that Easter Sunday so many years ago. Things are not always what they appear no matter if seen through the eyes of a small child, young mother, or a 68 year-old grandmother. This morning I got to thinking about why a rooster crows. I had heard it was to find a mate, but research tells me that a rooster will pretty much crow for any reason. Scientists have determined that they have an inner clock that calls them to crow before the sun rises. There are two roosters that live on the farm behind my neighborhood, and my house backs up to the road which the main house of the farm sits on. I’ve never seen them, but I hear them all day. So much so, I often don’t hear them even when they are crowing. I became fascinated with “my” rooster when I first heard the story of the rooster Chantecler in the play, so named, written by Edmond Rostand, (the man who wrote Cyrano de Bergerac). The play is notable in that all the characters are farmyard animals including the main character, a chanticleer, or rooster. Chantecler believes that his crowing causes the sun to rise and refuses to tell the other barnyard animals why his music is so beautiful. The play goes on with plots of deceit and murder, symbolizing the sign of times during Rostand’s life. Finally, Chantecler is lured from the barnyard by a beautiful pheasant who wants him to give up his crowing for her. He denies her request but he ends up protecting all the birds from a hawk. He and the pheasant end up together in the forest when his life is threatened and this time she saves his life. Both return to the barnyard where the pheasant resigns herself to being second place to Chantecler’s devotion to his duty of crowing every morning. We can all take a lesson in devotion to duty and what is wrong with crowing about it as well? I’m sixty-eight years old and my duty in this time in my life is to help take care of my grandchildren. Maybe not every day, but in a supportive role when needed. Whether I’m volunteering at their school, driving them to and from school, being the “mystery reader” in their classroom, or cheering for them at award ceremonies, I am present. Maybe I cook a meal or two now and then, or take them out for a treat, a movie, or lunch. Maybe we play a game of cards, Candyland, or I binge watch Fuller House with them on Netflix. I’m proud to be a grandmother and grateful for my inner strength, healthy outlook, and ambitious attitude that makes me want crow like a chanticleer rooster or the roosters that lives behind my house. I think it’s been two years since my last post. Not a whole lot has changed on the outside, but a lot on the inside. Since my hysterectomy three years ago, I’ve put on 25 pounds, lost a tooth and started taking high blood pressure pills. The weight gain was expected and a direct result of the hormones I lost from the surgery – information I could have used had my doctor accurately prepared me. The tooth loss was a misnomer other than the actual surgery which was the worst experience of my entire life in many ways. And the blood pressure was just a “fact of age,” I’m told by my doctor of record. But complications from the two surgeries were determining factors that brought the issue to the forefront. However, I do not want to be one of those people who spend all their conversations talking about their health and tribulations related to their health. So I want to share with you the good news. My two young granddaughters moved down the street last year and I am loving every minute of their presence in my life. It has been a learning experience for us all as they get to know their grandparents, aunts, uncles and cousins which they have never been around on a regular basis. All this while their mother learns to be a single mom and they go back and forth every other weekend to be with their dad who lives about two hours away. Everyone is working kindly to make the change a smooth one. I’ve been focusing on mindfulness and really enjoying Buddhist Monk Thich Nhat Hanh’s book “living Buddha, living Christ.” His approach to mindfulness is simple and empowering at the same time, with tips on how to be mindful when brushing your teeth to walking on the earth to preparing a meal and so on. The best part is that I’m finally beginning to become mindful without trying! Now that our backyard garden is producing, I am eating healthy foods and picking them and then eating them immediately which is an amazing experience. But when done so mindfully, it becomes a spiritual experience. I decided to make a squash casserole to contribute to a family dinner to celebrate my great-niece’s first birthday. I needed at least three pounds of squash and so went out to the garden and picked some. Inside I gently cleaned the squash and then began to peel them. As I held the squash in my hands I felt the warmth of the sun and the squash became alive in my hands. Tears began to run down my cheeks as I blessed the squash for providing the nourishment we were about to receive. It didn’t take long for me to become aware of the beautiful casserole I was preparing nor did it take long for the guests to taste and appreciate the dish I prepared. Being mindful, reminds me that I am part of a whole and that whole is Life. “In addition to reading ingredient lists, so you can ditch products made with artificial additives, including flavors, sweeteners, colors, and preservatives, clean eating is about steering clear of foods made from genetically modified organisms, and those treated with hormones and antibiotics, and going organic when possible, to reduce foods grown with man-made pesticides and fertilizers,” writes Cynthia Sass, a registered dietitian with master’s degrees in both nutrition science and public health. She goes on to explain that clean eating is not a trend but a movement focusing on how food we eat affects our body as well as our planet. My son says he doesn’t “live to eat.” Instead he “eats to live.” He doesn’t eat clean to change or influence others but he is an inspiration. At the same time he began this way of life, he gave up alcohol and meat. He eats fish and sea food and eggs, but no dairy. I do not eat clean totally, however I do read labels and try as much as possible to eat fresh organic foods especially ones I’ve grown myself. I do eat meat and drink a glass of red wine every day and I understand that high fiber foods that are good for me are also high in calorie. Combine that with the wine, odds are losing weight might not be in the picture. However, like my son, I have the power to choose how I want to look, feel and weigh. When I turn to the Spiritual connection I have within I realize what a young girl suffering an eating disorder realized, “A turning point for me, I can remember,” says Emily, “it was as if God was speaking to me directly, saying, ‘It’s not how you see yourself but how I see you that will heal you.’ And I started seeing more of what God sees. God doesn’t see imperfection, God sees good and only good.” And like my son, she went on to not only heal her eating disorder but also the need to wear glasses. It occurred to me that if I combine my healthy eating habits with my connection to God and begin as Emily suggests: to see me as God sees me, I can then truly become the person I want to be. I recently took up walking at the local mall. Walking 30 minutes at a fast pace, I seem to average 1.7 miles a walk. My Fitbit tells me exactly how many “active” minutes I walk which is nice that when I make a pit stop at the restroom, it doesn’t count against me. My goal was to lose weight. I have not. I have, however, dropped one size in my jeans; so that is nice. Two months ago, I started using portion control and have pretty much trained my stomach that a bread and butter size plate is all I need. I decided that it didn’t matter what I ate as long as it fit on the plate. That may have been a mistake in thinking. So two weeks ago I gave up drinking my few glasses of wine each night, mainly because of the sugar content. My inherent wholeness is embodied in every cell of my body. I give thanks for my body and that I can choose to take care of it as I see fit. I avoid sweets and eat balanced meals that are healthy. I enjoy quinoa, lentils, healthy fats, and garden greens from my backyard such as kale, beets, lettuces, arugula and herbs, year round. I also enjoy seasonal foods during the summer such as tomatoes, squash, okra, strawberries, cucumbers, zucchini and squash. God’s pattern for perfection is the blueprint of my life. I am whole, well, and happy. I plan to continue on this path, one day at a time. And so it is. Good Food, Good Drink, Good God, Let’s Eat! Gone for five days and it rained for four of those days. Lucky days for our garden (and for our son Brian who offered to water both our garden and his brother Daniel’s garden.) We came home to brand new vegetables and an abundance of others that had already been producing. Always grateful, we love sharing and my new neighbor mentioned she was a vegetarian (for 55 years now) and she got a large brown bag of assorted vegetables right after I cleaned them. Included in yesterday’s pickings were cucumbers, squash, zucchini, lettuce, beets, purple hull crowder peas, bell peppers, okra, and three varieties of heirloom cherry tomatoes. Yesterday for lunch I made a green salad with three varieties of lettuce, the cherry tomatoes, avocado, pine nuts, pumpkin seeds, boiled egg, chopped broccoli, cucumbers, and quinoa. It was delicious. We had a half a grilled cheese sandwich to top it off. For dinner, I made cheese grits from organic polenta and because we do eat meat from time to time, I sautéed some chicken and then added a cold salad I made early in the day which had cucumber, tomato, and onion soaked in my homemade dressing of Bragg Organic Apple Cider Vinegar, olive oil, and honey. For lunch today, I stir-fried slices of zucchini and veggie burger (which we split), deviled an egg for each of us, sliced some cold cumbers and tossed on a few cherry tomatoes and topped it all off with a couple of spoons of my homemade bread and butter pickles that I made last week. Tonight I am making a zucchini risotto with sun-dried tomatoes and lots of other herbs and greens from our garden. I’ll grill a slice of pork loin topped with garlic, grated lemon, red pepper flakes and some Louisiana seasoning. And we will finish off our dinner with a flourless chocolate c hip almond butter muffin. I found this recipe at the Huffington Taste website. Every once in a while it’s nice to not know the calorie count on something. But eating healthy the majority of the time allows for a few hiccups and I do love chocolate chip anything! 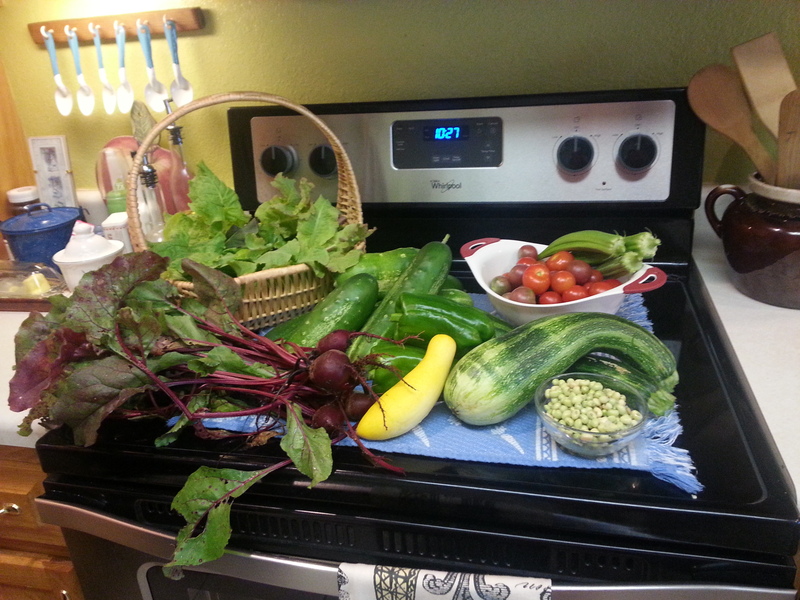 But most of all, I enjoy taking advantage of the bounty from our raised gardens in our little back yard. When I think about all the years we didn’t have one, I say a prayer of gratitude for what we have now. Growing our own vegetables helps with our budget and it helps us know that what we are eating is organic and good for us. And we get to enjoy new foods, create new recipes, and share our bounty with friends and family.